The mornings now have a slight chill but the fishing has not cooled off. 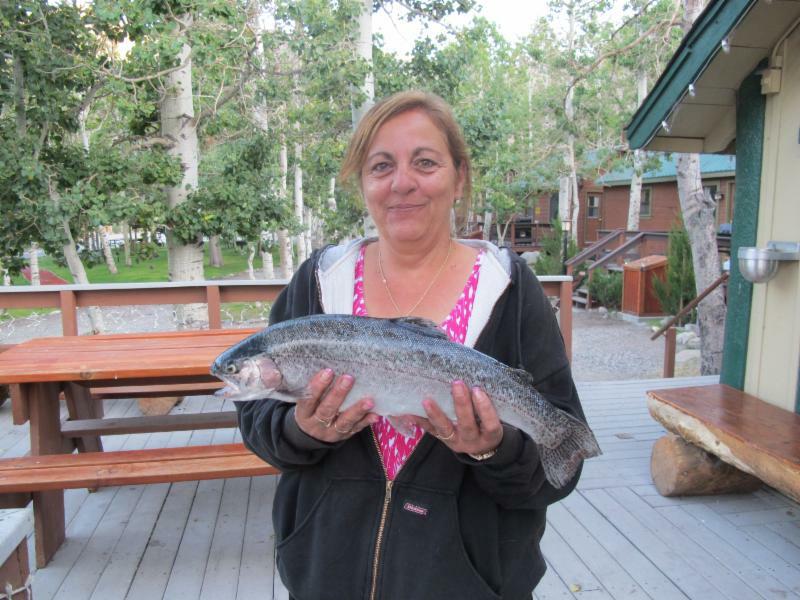 It was another week with some nice fish being pulled from the lake. Trolling continued to provide some good results. Last week the trolling was the best on the Outlet/Marina side of the lake, off the shelf out from the Jetty (6-7 colors). This week the Outlet/Marina side of Convict stayed productive but anglers were also hooking up from the Inlet and along the North Shore (4-6 colors). From the shore the Inlet and South Shore were the happening spots. Lure fishing seems to be picking up as we move into autumn. Fall is the time for exceptional fishing. 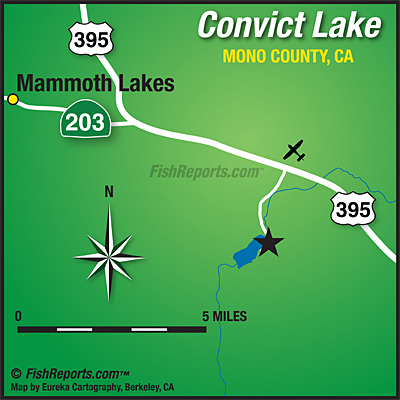 Are you Convict Lake bound? 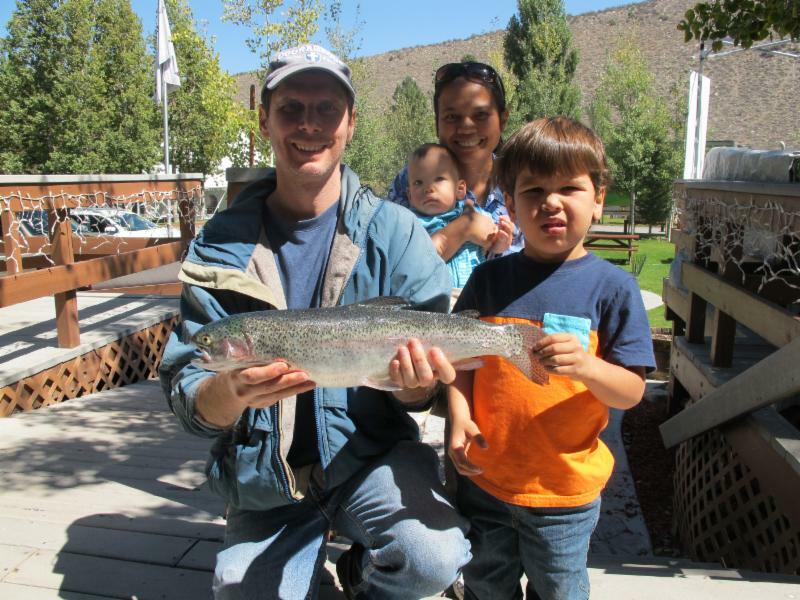 Catch of the Week: Tim Prem from Mammoth Lakes, CA hooked a 4 pound 10 ounce toad. Tim was using a Red/Gold Thomas Bouyant and he was fishing the Inlet. Congratulations Tim on a great catch! Tactics/Bait: Thomas Bouyants and Tasmanian Devils (trolling & casting) were the lures of choice this week. The top colors for the Tasmanian Devils were Black Thunder and Bloody Frog. Red/Gold was the top preforming color with the Thomas Bouyants. A lot of different colors of Powerbait were working especially anything with garlic.The most successful Powerbait colors were yellow and chartreuse. Don't forget about the old reliable inflated nightcrawler. The Inlet was fishing very well this week. The South Shore was also another hot spot. Other locations fishing well were Inlet, Hangman's Tree, Jetty, South and North Shore. Here is a list of other baits/lures that can be productive: Sierra Slammers, Tasmanian Devil, Green or brown Marvel Fly Lures, Trout Teasers, Panther Martin, NeedleFish, Rooster Tails, and Bite-on Fury Shad or Lip Ripperz Hatchery Dust on Powerbait. Weather: Highs are going to be in the High 60's and the lows in the mid 40's. The forecast is calling for slightly cooler temps and chance of thunderstorms throughout the beginning of next week. Here is the National Weather Service link that is usually quite accurate: 7-Day Forecast Convict Lake.